This tutorial walks you through how I made my butterfly wings for my Marianne cosplay. I believe it could be easily altered to meet multiple wing needs. Part 1 focuses on the wings, part 2 on the harness. First, you need to decide how large your want your wings, and the basic shape. Reference images! I decided to use the following image to my basic shape, and decided to make the top and bottom a separate full poster board sheet. Sketch out your idea onto your poster board. For me, I needed 4 copies of the top drawing, and 4 of the bottom. Be mindful of any price tag stickers. Reverse your pattern if needed so these stickers are on the inside. Cut out. I sketched one top and one bottom, then used the cut out as a pattern for the rest of the pieces. Using the E6000, glue your wire to the entire outer edge of 2 tops and 2 bottoms. Make sure they are mirror image tops and bottoms! Glue top and bottom together at center piece. You should have two wings that look like the following (and one should be a mirror image of the other). Now, using your string of LED lights, glue (using E6000) to the inner edge of your wire. This is a slow process. You need to do a small section, clamp, let dry, and repeat. If your lights have a peel off sticky back, be sure to peel off the paper, but do not use the sticker to attach lights to your wings. It's not strong enough. Now, your LED string has loose wires, which should be at your center near the pipe. You need to attach these to your connector. I recommend soldering these, but it's your call. Do this at this point and test the lights to make sure everything works properly. You will need some sort of right angle support in the center. I used copper plumbing pipe because I couldn't find PVC in the size I needed and I don't have a work space capable of making something out of wood. Use whatever you like. Glue, using 7800 adhesive, to inner center piece. Make sure the right angle points down. It is going to be used to attach your wings to your harness. Repeat on other wing. Once both are done, put a string of glue on the LED light and place the other top and bottom pieces on to hide your LED string. Using the fabric of your choice, place over your wings, rough measure and cut. Iron!!! Do not skip this part. Also, test a scrap so you don't melt the fabric and ruin an entire piece (like I did). Glue in place. Once glue dries, trim fabric. Repeat on other side and other wing. 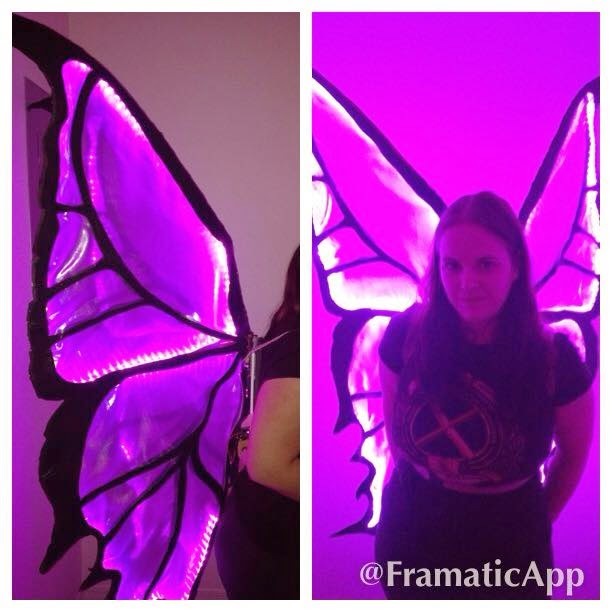 Now, my wings were so heavy with the LED lights that the wire was not strong enough to keep my top half of the wing from flopping over. To rectify this, I used a dowel rod with a groove for the copper pipe. Make sure it is painted the color of your poster board so it blends in. Also, I found that adding at this point as opposed to earlier was easiest. Make sure the long end of your dowel rod is pointing up. This will give it the support needed so it doesn't flop over. Repeat on other wing. Now, paint the entire edge of both wings (both sides) black (or whatever color you want it to be). Congrats! Your wings are done! In part two, I will show you how I built my harness. This is the first wig I have ever styled. Therefore, there may be easier ways to go about some of the things I did. But here is my walk through. As always, make sure you have plenty of reference images. First, pin bangs. Then, measure out and cut the backer rod. Paint the backer rod to match hair color. Position your backer rod. Now, starting with small sections, wrap hair around the backer rod. Continue until all the hair is wrapped. Secure with elastic. My pictures for this are with a gray backer rod, because I wanted to make sure you could see what I was doing. My final product uses the painted backer rod. Tie blue ribbon around secured end of backer rod. This will be twisted up into her 'bun' later. Be sure to tuck your loose end in so it's not sticking out. Gather hair into a low pony tail. Twist, including the ribbon. Twist against back of head in low bun. Bobby pin like crazy, doing your best to hide all the pins. This is why white bobby pins are important. Basically, that's it. I recommend wearing it around the house one day before your convention to make sure the style stays put. Also, some hairspray to tame any fly aways.